We’ve paired up with Urban Anglers USA to raffle off the baddest, raddest, recycled fishing net in ALLLLLLLLL the land. Support CfR by taking a chance on a pink River Rats Net donated by Urban Anglers USA. Ten bills takes a chance, drawing 4/19, no need to be present (only lucky!). Read more about these fly guys and what they do below! When you think of your favorite fishing spots, urban waterways probably don’t come to mind. You probably think of a remote destination that’s outside the hustle and bustle of the city limits. The great outdoors, Mother Nature, wide open spaces, we get it. However, many of you may be overlooking an untapped honey hole right outside your door. By fishing urban water, you can fish a lot more often and may just land that monster lurking in the depths of your city. At Urban Anglers USA, some of us throw bugs on a fly rod, and some of us toss crank baits on a baitcaster, but we are all united in the pursuit of fishing urban water. We started Urban Anglers USA as a way for all urban anglers to come together as a community and share their urban fishing adventures. A vital part of our urban fishing adventures is river clean-up. We were always finding random sporting equipment in the river. Basketballs, baseballs, baseball bats, volleyballs, bowling balls, etc. You name it, we have found it. Our buddy Nick even found a bowling ball with “Nick” engraved on the ball. It was creepy. We were trying to figure out a way to donate or recycle what we were finding when we came up with the idea to repurpose old tennis rackets as Urban Anglers USA “River Rat” fishing nets. These “River Rats” are legit tennis rackets re-threaded to hold quality rubber netting. The carbon fiber frames are normally only found in high price fishing nets, but by using old equipment that would normally end up as trash, we can offer superior strength and quality at a much lower price. The custom netting is 11″ deep and perfect for landing bass and trout. It is also capable of wedging a big carp in there. 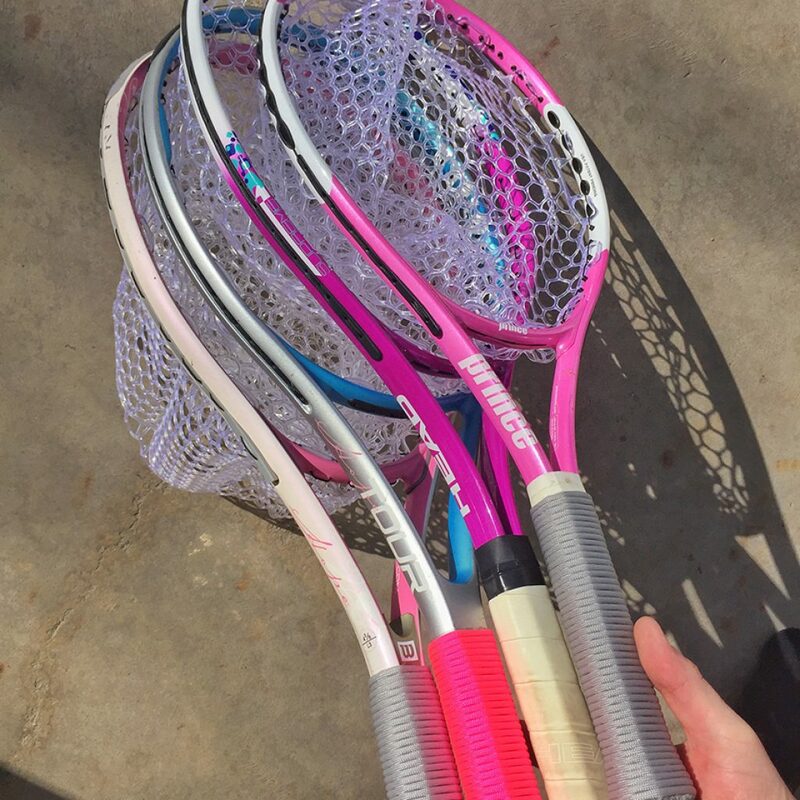 Each refurbished racket averages 28″ in total length. We don’t always find full sized trash, so we also offer junior sized tennis racket nets as “CreekRats.” These junior sized rackets feature the same size head/basket as an adult sized tennis racket, but with shorter handles. Racketball rackets feature a slightly different head shape, but they hold the same size netting. CreekRats are perfect starter nets for kids, or for fishing smaller water, but can still handle the same size fish as our RiverRats. We sew in the exact same size netting for all models. Depending on how trashed out the handle wraps are, we either stick with the original hi-grip racket tape, or will re-wrap them with high strength paracord. This project started with just the rackets we were finding in the river, but as the RiverRats have become more popular, we have been hitting up garage sales and dumpster diving in an effort to up-cycle old rackets and reduce plastic in the local landfill. If you already have an old tennis racket you would like to convert, we do offer our custom netting as a replacement kit on our website. The kit includes the net, twine, and the needle required to string up a RiverRat repurposed racket net. Please email us at urbananglersusa@gmail.com if you have specific color requests. We currently do have a lot to choose from, but since we randomly come across these rackets, we may not be able to accommodate. If you order one without any specific request, a random racket will be netted and sent out. It will be a quality refurbished racket, but the color will be an added surprise. Follow us on instagram (UrbanAnglersUSA) for daily urban fishing pics, and for updates of the nets available. For helpful tips on hitting the concrete jungle, visit www.urbananglersusa.com for all things urban fishing. Use hashtag #urbananglersusa on your urban fishing pics and we will share on instagram. Tight lines!